Good thing too, since the h-anger was starting to set in. Fortunately, Yoogane delivered. 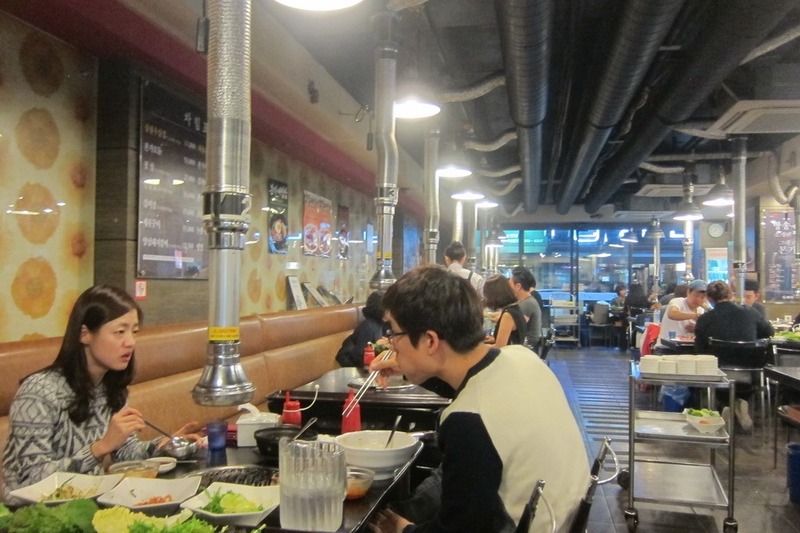 A strange mixture of a BBQ-joint and a bibimbap style meal, Yoogane is a cook it yourself kind of establishment. 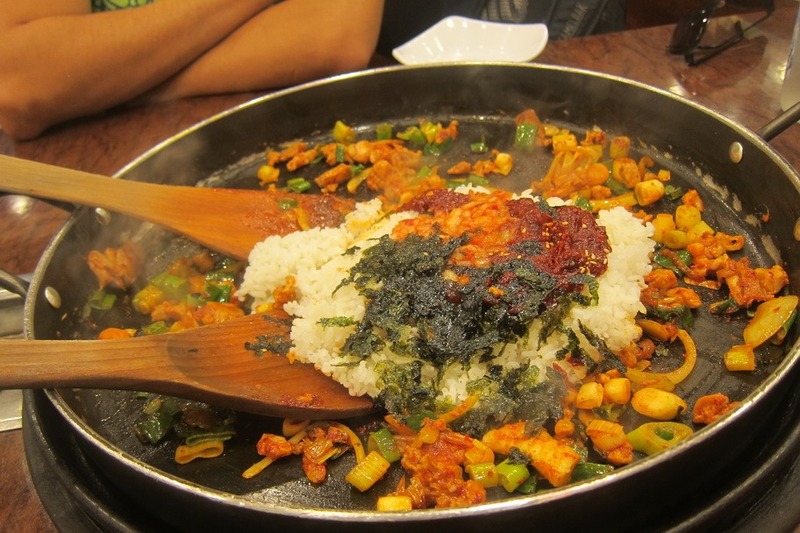 Mrs. Selfish and I immediately ordered a spicy chicken-galbi + regular chicken galbi fried rice, for roughly 5000 KRW each (~$5 USD). 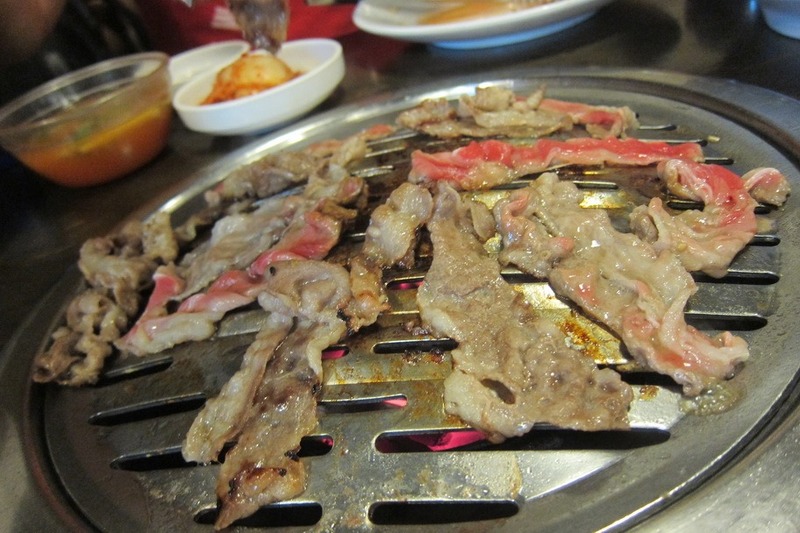 After taking our order the server came back and dumped pre-marinated meat and scallions onto our skillet. 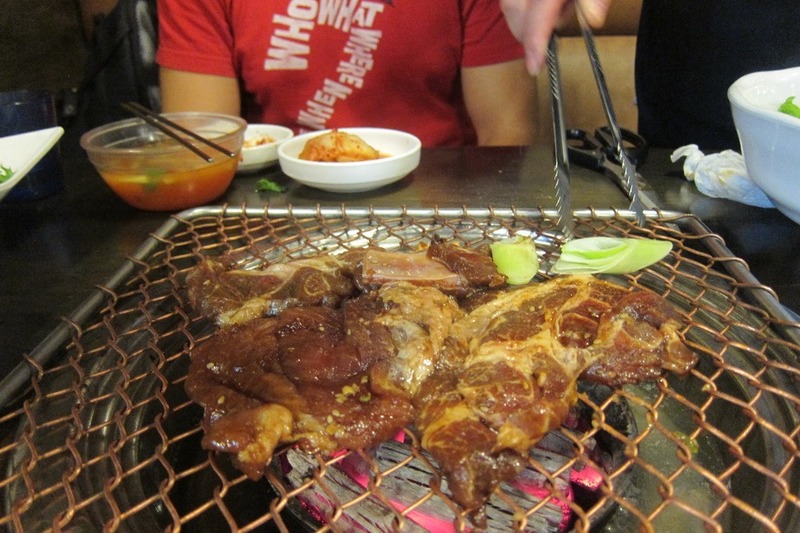 The smell was intoxicating: meaty, spicy, and slightly tangy with the type of freshness one can only get out of freshly cut scallions. After the meat cooked the server came back with a bowl of rice topped with dried seaweed, which he dumped unceremoniously into the skillet. The end result was something that looked very much like paella. 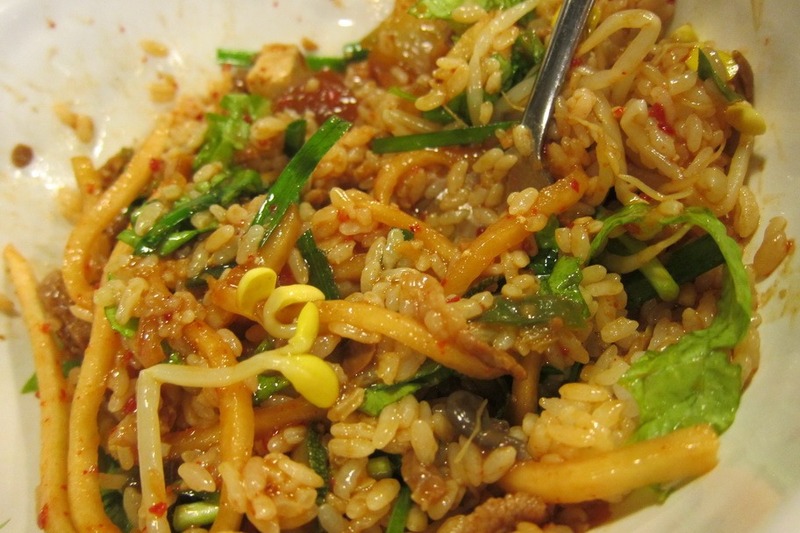 Crispy, spicy, and oh-so savory. 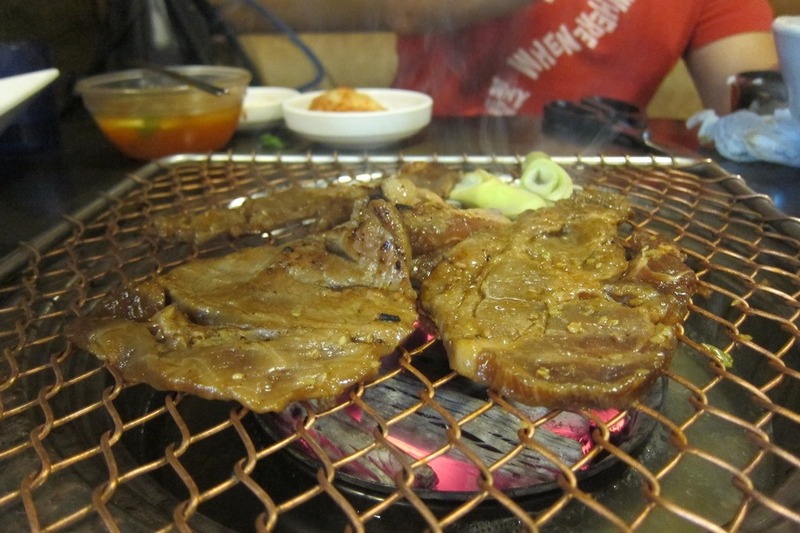 A fine meal for two for the low, low price of 10,000 KRW (~$10 USD). 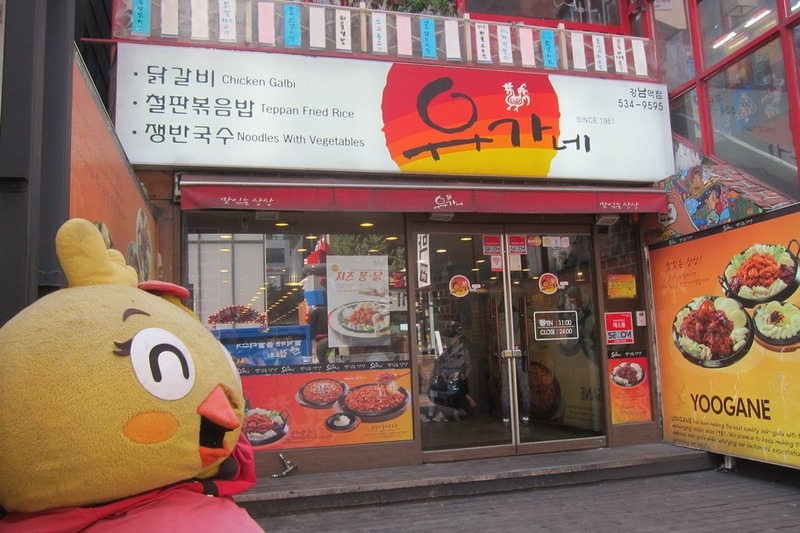 For our next meal we hit up KyoChon, a local fried chicken chain. 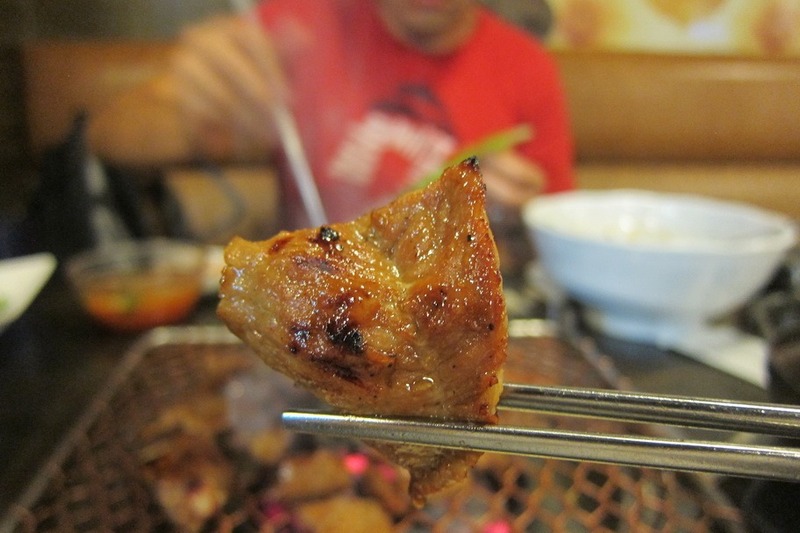 KyoChon is a local success story, and now boasts over 100+ locations (including NYC of all places). 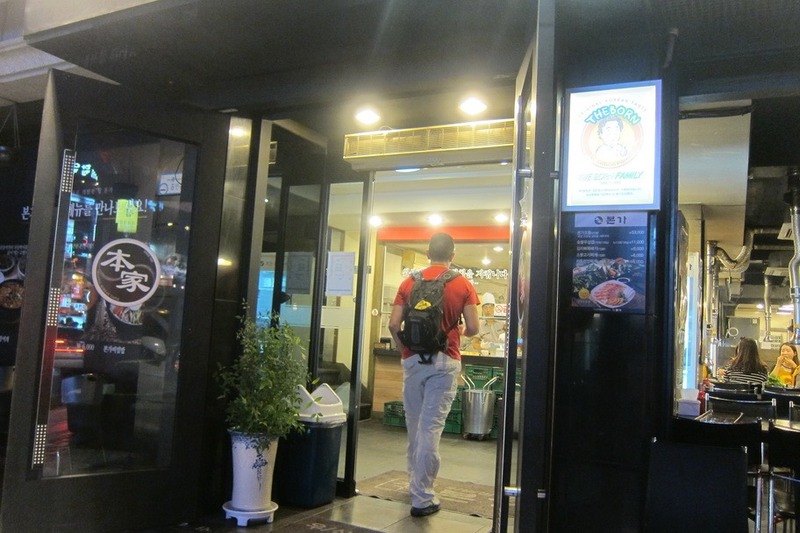 This particular store was located north of Gangnam station off of Saecho-daero 77 gil street. 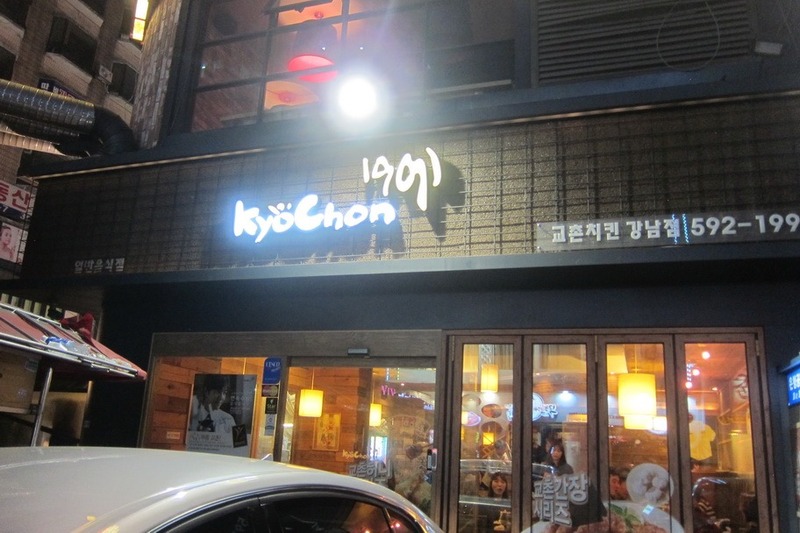 KyoChon had a much more polished look than the previous fried chicken places we had tried our first time around Seoul. 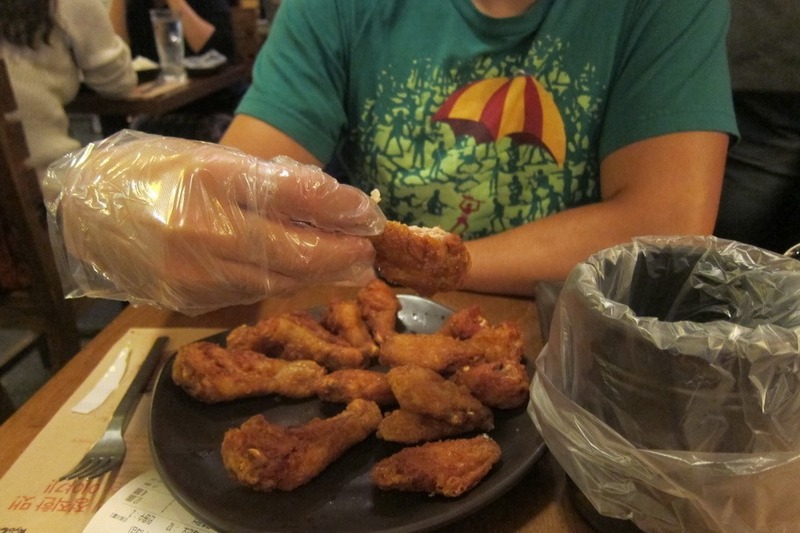 The chicken, however, was still excellent and is exactly what one should expect from a Korean fried chicken establishment: crispy, tender, light, and utterly delicious. 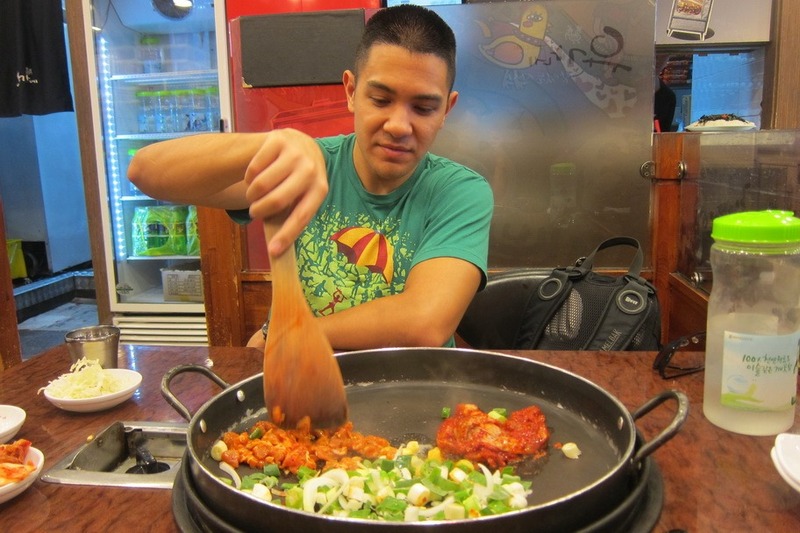 Unfortunately, you can only order the chicken in large batches – no mixing or matching here folks, so come hungry! 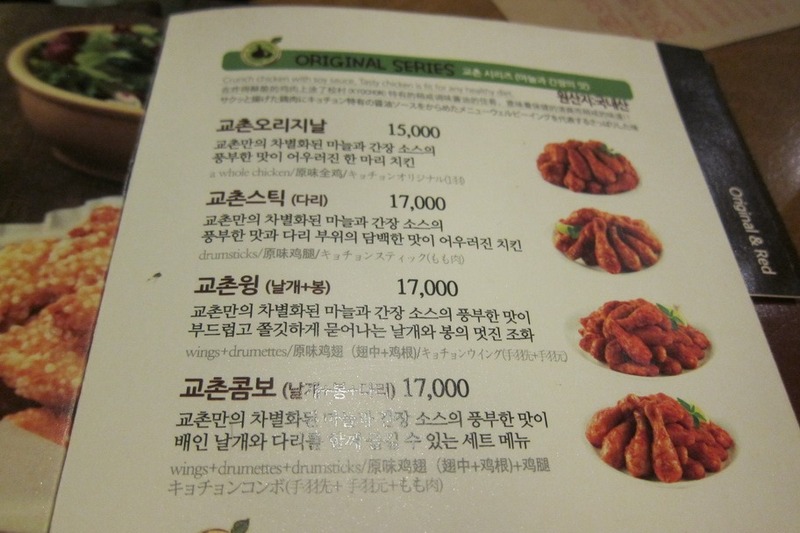 For 17,000 KRW (~$17 USD), Mrs. Selfish and I grabbed a plate of wings + drumettes and drumsticks in the original sauce. The plate came with a complementary side of pickled daikon cut into cubes. Pickled daikon is kind of a ubiquitous side dish in a culture obsessed with side dishes and in this case is a really refreshing way to cleanse your palette when eating a lot of spicy, fatty foods. While I found the portion size at KyoChon to be a little too small for two people, 2 orders would have been waaaaaaay too much. Fortunately we had been eating all day, so I wasn’t forced to decide on whether or not I wanted to brave a full order on my own. 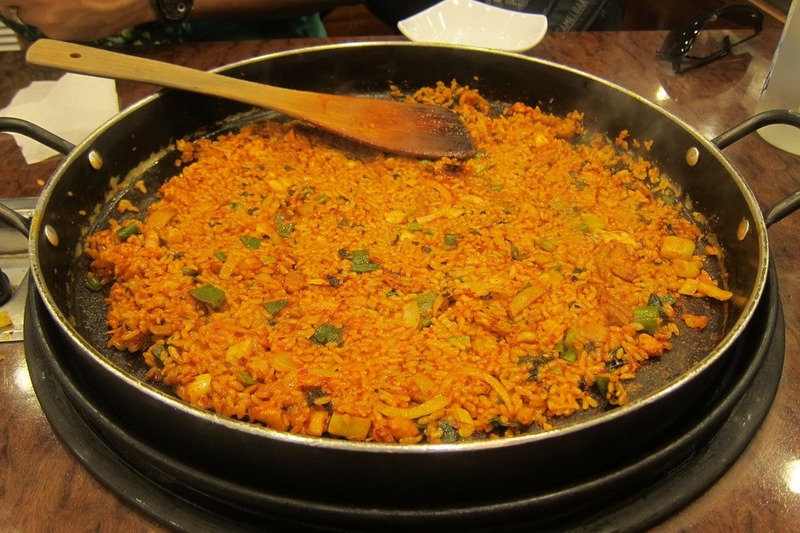 Our favorite meal on this entire trip, however, was easily at Bonga (or TheBorn restaurant?). 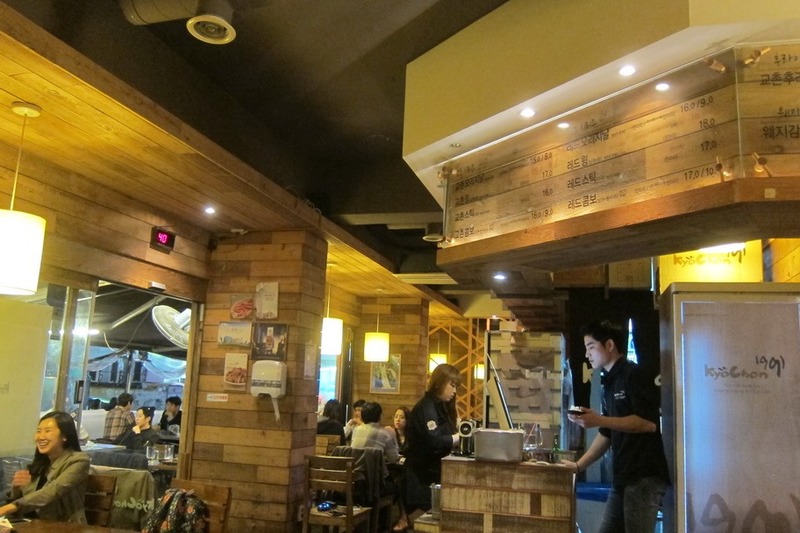 Located north of the Sinnonhyeon station off of Bongeunsa-ro 1-gil street just north of Gangnam-daero 118-gil street, Bonga is a killer Korean BBQ joint, serving up some really choice cuts of meat. If you are protein obsessed, this is your nirvana. 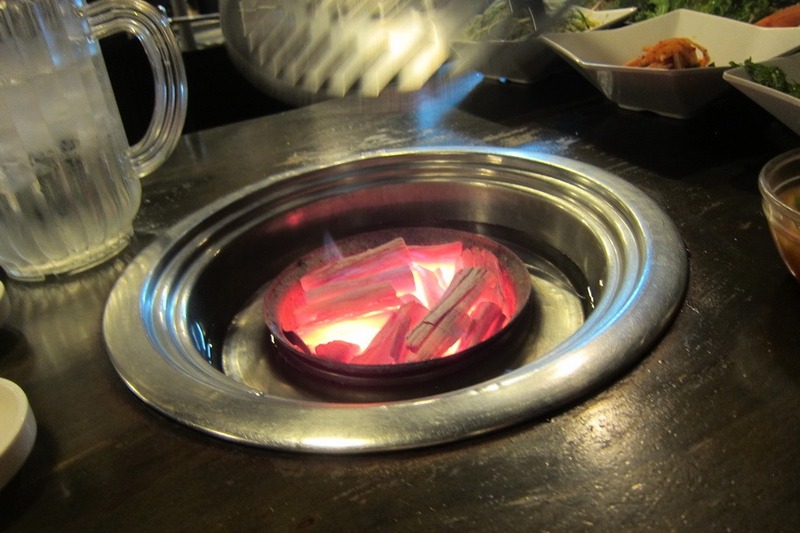 Bonga is a Korean BBQ joint. You order meat. You cook meat. You dip meat in sauce and wrap it in some sort of green before stuffing your face. It is a delicious, smoky, sometimes messy affair. 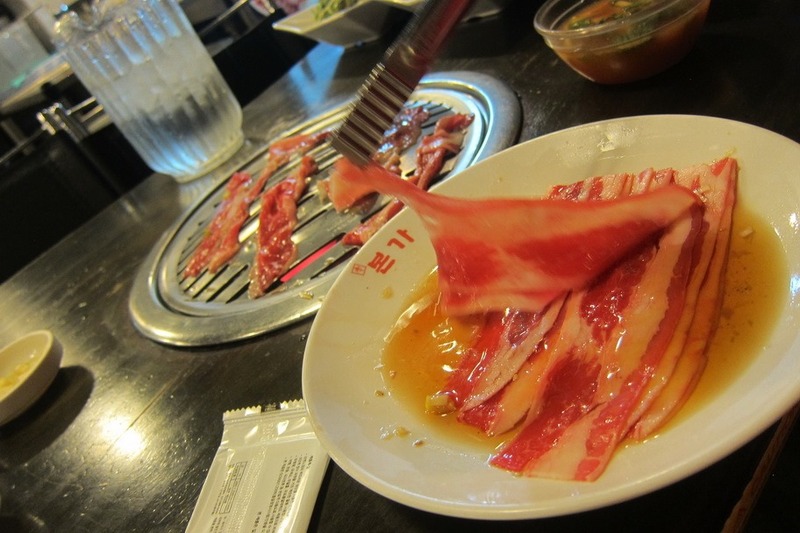 What really separates Bonga from the rest of the bulgogi/galbi crowd is their signature dish, Woo Samgyup : thinly sliced beef brisket in their signature (and presumably secret) spicy sauce. 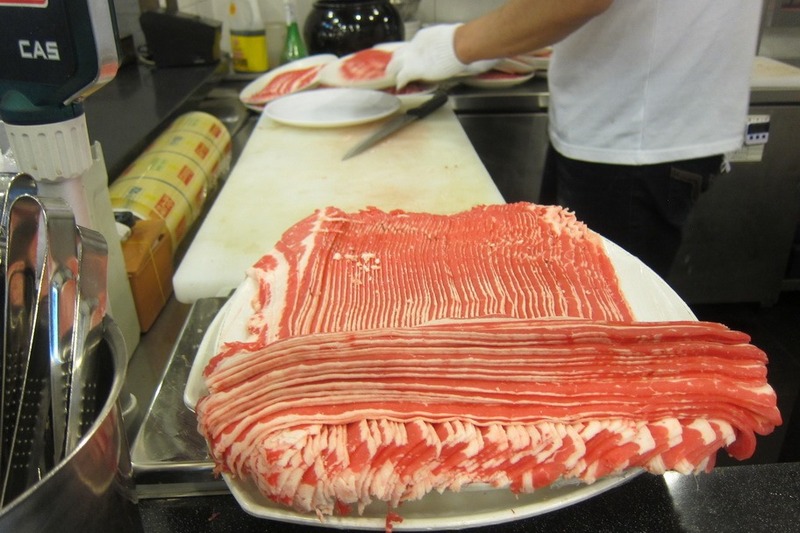 Step 1: Spread out and cook the meat. Step 3: Wrap in (optional) greens. Bring to the head. Enjoy. 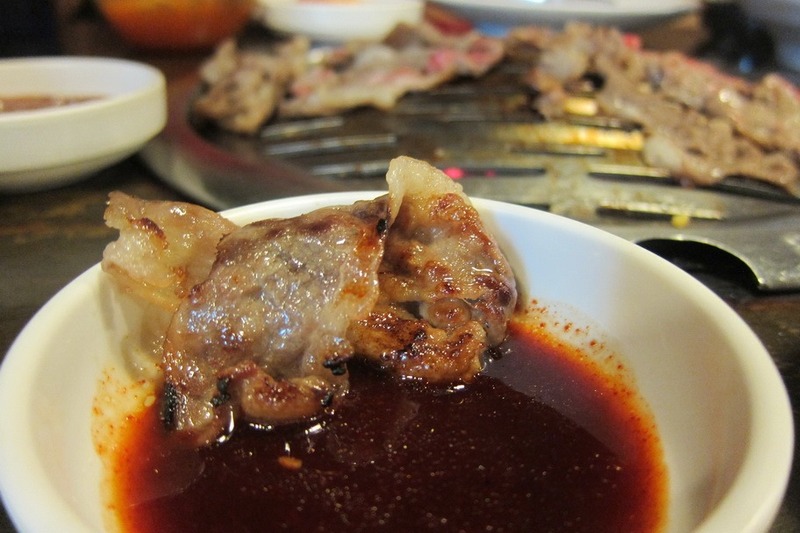 I am a huge fan of brisket, and the Korean version DID NOT disappoint. Crispy, smoky, tender, near-bacony. 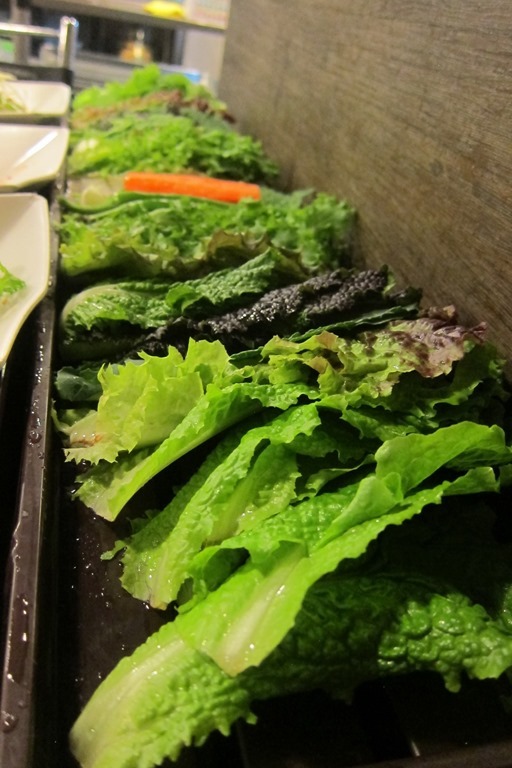 Your tiny slice of heaven, wrapped in lettuce and doused liberally in just-as-astonishingly good secret sauce. 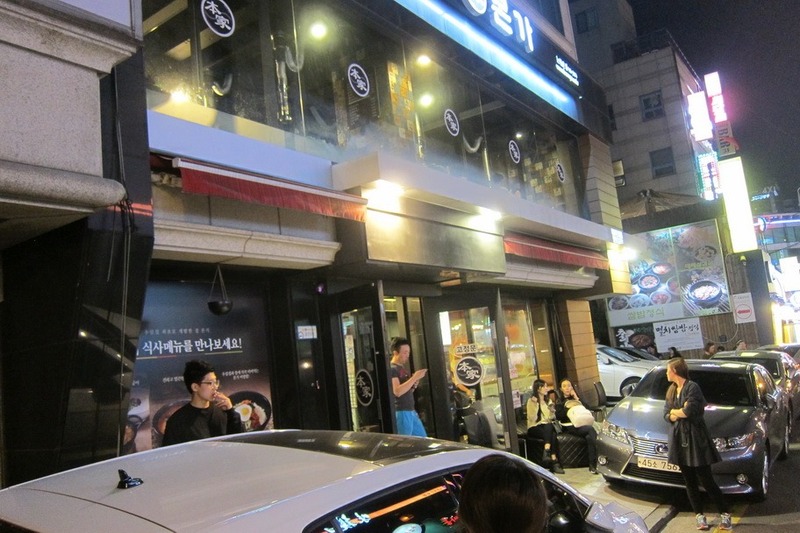 At 11,000 KRW (~$11 USD) for 150g you are not likely to encounter a cheaper, better natural high. 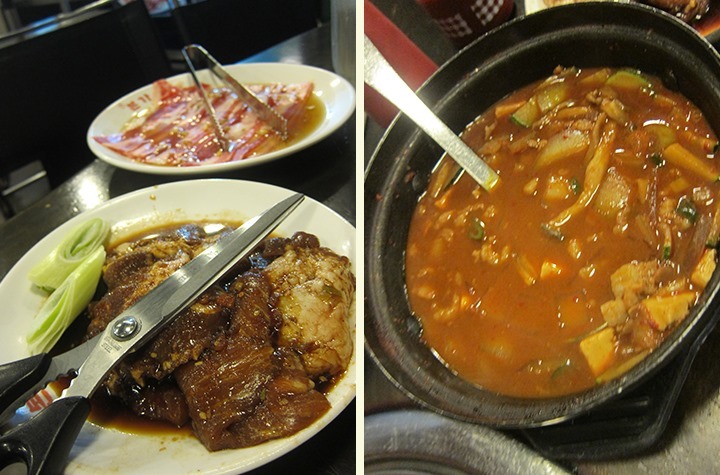 We also ordered their galbi, which was good and grabbed an order of the Chadol-Duenjang Jjigae. 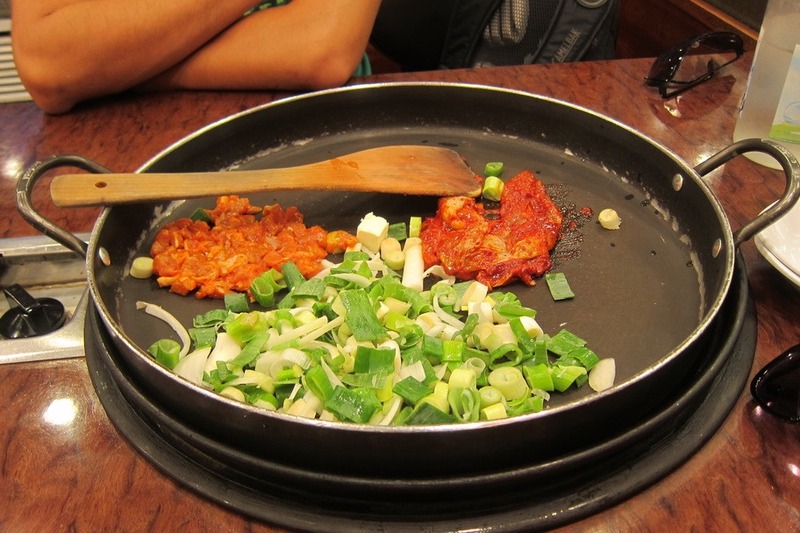 The galbi was decent, but the Chadol-Duenjang Jjigae at 6000 KRW (~$6 USD) was regrettably not worth the money – and definitely not worth the stomach space. 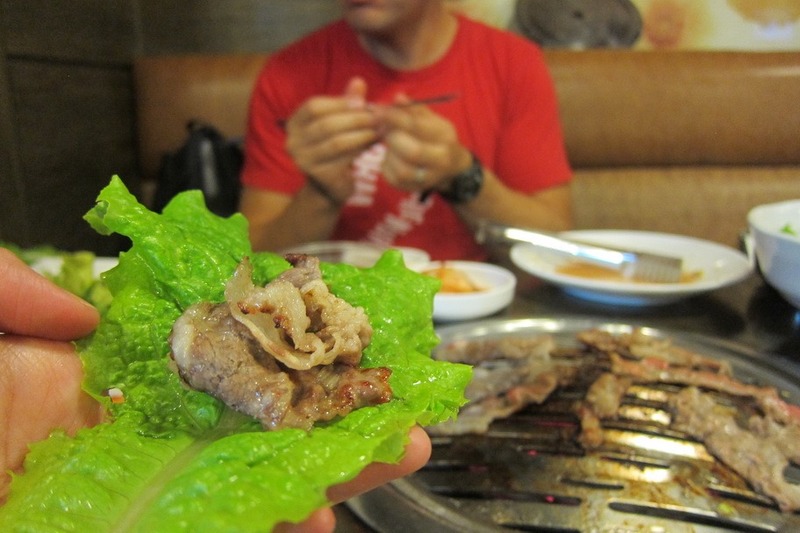 I ended up drowning my disappointment in another order of the fantastic Woo Samgyup. 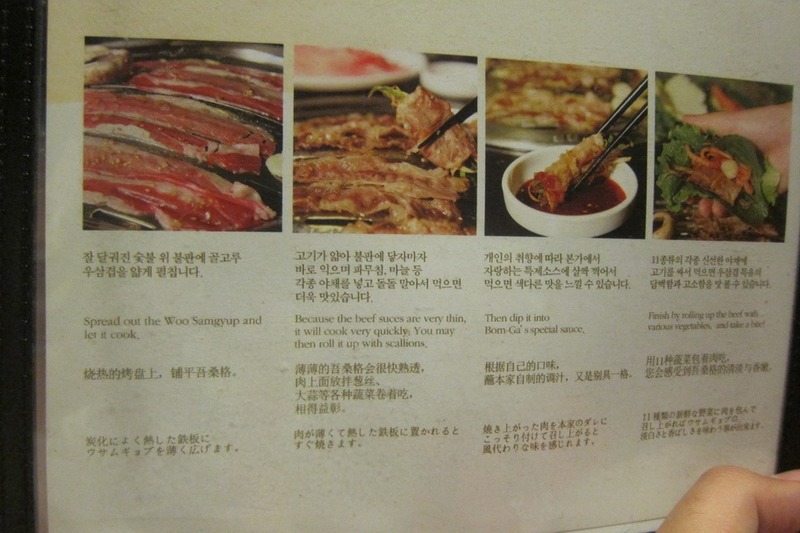 Overall a fantastic meal, and not too expensive at 40,600 KRW (~$40 USD) for the two of us. 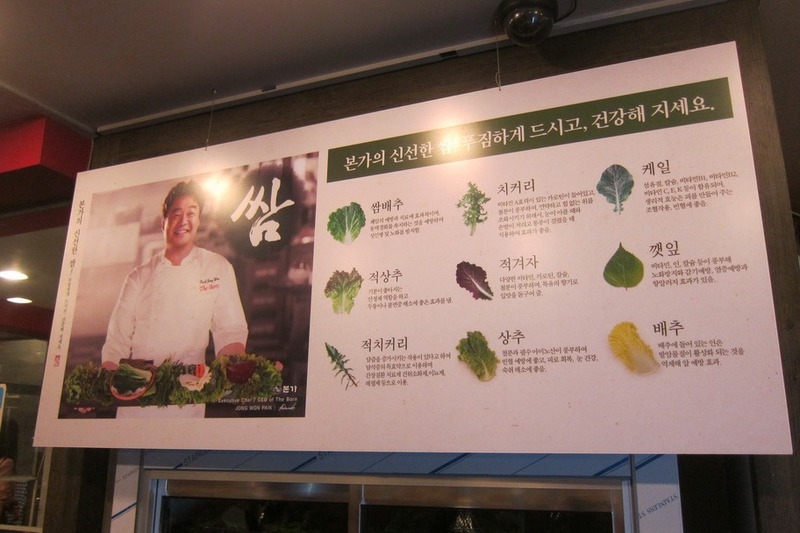 If you are in Seoul I urge you to drop by and give it a whirl. Join us again tomorrow where I’ll go over Seoul’s other palaces.